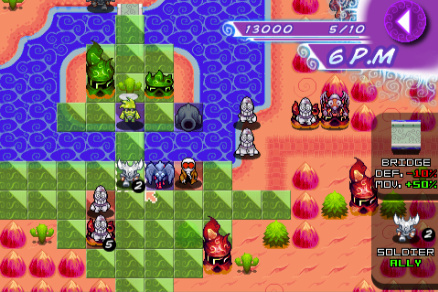 It looks like the wait for the WiiWare and DSiWare versions of Luc Bernard's Mecho Wars won't be too much longer. According to Oyaji Games' web site news section, both games have passed approval at Nintendo and are ready to go. Below is the news snippet from Oyaji Games' official web site. Mecho Wars on WiiWare and DSiWare have both officially been approved by Nintendo and should be out in the next few months. We'll have more information on Mecho Wars as it becomes available, as well as a full review of the games when they hit the WiiWare and DSiWare services. Until then you can take a listen to the official theme song from the WiiWare version of Mecho Wars below. "Revive Me - Theme from Mecho Wars"
Wow, this is going to be Luc Benard's first game to be released on WiiWare. Looking forward to it. More appealing and promising than Eternity's Child, IMO. I've played the iPhone game and it's a lot of fun. Easy to get into, yet it offers some good challenge later on. Been looking forward to this, hopefully it's up to the same standards as Swords&Soldiers. I also hope it's not too short. Mecho Wars is on sale for $1 at this very moment! Buy it now! I got it for $5 and I'm not bummed at all about missing this sale because it was worth it. Yes, this great news! This game looks like a lot of fun! I can't wait to play it! Does it have online play? That screenshot looks semi-Advance Wars-y. Is it a similar kind of game? I love this kind of strategy games. But I think they have to do more to make it a WiiWare game then just add motion controls. It is very Advance Wars-like. It's simple enough for anyone to play, but it does get quite challenging later on. This new update to it on iPhone is supposed to add a lot to the experience and it should be included in the WiiWare and DSiWare releases. We've got an interview with Luc coming up soon. Not sure if the WiiWare/DSiWare versions will have online but the iPhone is supposed to be getting an update that introduces it. Definetly purchasing this game. On DSiware I will definetly buy, but not so sure about the WiiWare one, unless with online. I'll be putting up some impressions of the iPhone Mecho Wars game in the forums soon. What happened to Eternity's Child? I was really looking forward to that one. I was also looking forward to Animales de la Muerte... How come all the games I want to play on WiiWare are the ones that never get released?